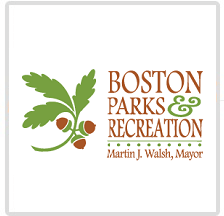 Boston Parks and Recreation - Boston GreenFest - Aug. 16-18, 2019 - FREE! Create and maintain clean, green, safe, and accessible open space in more than 2,300 acres of park land throughout Boston. Boston Parks and Recreation is responsible for 217 City parks, playgrounds and athletic fields, two golf courses, 65 squares, 17 fountains, 75 game courts, 16 historic and three active cemeteries, urban wilds, four High School Athletic Fields, and approximately 125,000 trees, all covering 2,346 acres, 1,000 of which comprise the historic Emerald Necklace. We are also responsible for more than 35,000 street trees. Every year, the Parks Department is very generous and loans 12 large planters to Boston GreenFest to beautify the plaza. Boston GreenFest is forever grateful.